Figure 2. Bacteria are a common form of microbe. Shown are Anthonie van Leeuwenhoek's drawings of bacteria in the human mouth. Published 1684. Figure 3. A 'tailed' bacterial virus from the sea. Such viruses (usually called bacteriophages, or more simply phages are the most numerous biological entities on the planet. They are so small that their structural features cannot be revealed with light microscopes, and the special electron microscopes (used to provide this image) are needed to discern details of their shape and form, which is completely unlike any cellular form of biological organization. Microorganism is the scientific word for 'germ' and is generally used for any life form that is too small to be seen individually with the naked eye. Some microorganisms were known before the invention of the microscope because, like the phosphorescent plankton of the seas and the green fuzz of mold on bread, they could be perceived in swarms or groups. Most microrganisms do not exist in such obvious colonies, and their presence as individual life forms has only been appreciated since the 17th century. Even now, since special knowledge, techniques, and instruments are required to recognize them, the concept of microscopic life and an appreciation for the importance of these organisms in the health and ecology of all living things is not universal. How important are microorganisms? Everywhere humans can venture on our planet, and in many places where we cannot ever go, microorganisms are present. The fertility of the soil, the proper digestion of foodstuffs by vertebrates, the ability for dead plants and animals to decay and allow their nutrients to be recycled, the rising of bread and the fermentation of beer, are all dependent upon the existence of microscopic life. Many people automatically assume germs are bad, because they cause infectious disease, but most germs (or microbes, as they are also called) do not cause disease, but promote health. Both the workings of the living world and the grand biological cycles of matter on earth, and human survival, are intimately dependent on the diverse chemical activities of microbes. The outer surface of animals and plants, and the lining of much of the digestive tract of animals, is completely covered by colonized microorganism that create an environment that is required for the healthy function of these living surfaces. All other life descended from microbes. Current investigations of microbes are revealing clues about the earliest stages in evolution of life on earth stretching nearly four billion years ago. Because of the ease with which large numbers of them can be grown, microbes are important for teaching us about genetics - the science of inheritance. Study of inheritance of traits in microbes has enable biologists to work out the intricate details of inheritance in most living cells, and led to discovery that DNA is the chemical through which inheritable traits are passed from generation to generation. The short generation time of certain bacteria, along with a high mutation rate, has provided the first laboratory proofs of the theory of natural selection and evolution. The investigation of microbes and their genetic behavior has been fundamental in the flowering of the biological sciences that occurred during last century, starting in the mid-1940s. The delightful and historically important hand drawing (Figure 2) was made more that three hundred years ago by Anthonie van Leeuwenhoek when recording the first observations of germs. Made with the assistance first microscope built by van Leeuwenhoek, it shows what typical microbes look like, which in this illustration are bacteria scraped from the human mouth. Minute rod-like forms (called bacilli, sing. 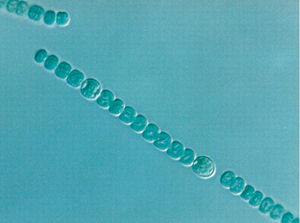 bacillus) about 1 micrometer (1/1000000 meter) long, similar sized spiral cells, or spherical cells (called cocci, singular coccus) are all typical of common bacteria. 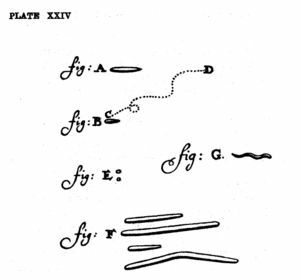 The diagram also shows van Leeuwenhoek's depiction of bacterial motility. Microbes are thus organisms that are microscopic (too small to be visible to the naked eye). Micro-organisms are often considered to be single-celled, or unicellular organisms, but many are multi-cellular, and many multicellular species of plants and animals are microscopic. Microbes also include biological entities - the viruses -- that are even too minute (less that 300 nm in diameter) to seen even with a light microscope, that do not have a cellular structure based on a cell as a unit of form. There are diverse forms of viruses. The commonest type are those that propagate in bacterial cells and these are usually called phage (from their scientific name bacteriophage, meaning bacterial cell eaters. The figure below shows a phage found in the sea. It consists of a cap made of protein, and containing the DNA genetic material, a tail, and tail fibers, all taking the general shape of a hypodermic syringe. This virus particle is thus composed only of structural protein and (as is characteristic of viruses in general) a single type nucleic acid, DNA in this instance. The phage tail is deployed for syringe like injection of DNA into its target bacterial cell. Phage are the most abundant biological entities on the planet, and total phage number in the biosphere may exceed 1030. Marine phage are important in influencing ecological processes in the surface layers of the ocean, and in mediating gene exchange and cellular evolution in marine microbes. Microorganisms are vital to humans and the environment, as they participate in the Earth's element cycles such as the carbon cycle and nitrogen cycle, as well as fulfilling other vital roles in virtually all ecosystems, such as recycling other organisms' dead remains and waste products through decomposition. Microbes also have an important place in most higher-order multicellular organisms as symbionts, and important organelles of cells, the plastids (chloroplasts) and mitochondria are the result of endosymbiosis of microbes within eukaryotic cells. The failure of Biosphere 2 has been blamed on on an improper balance of microbes. Microorganisms are found in virtually every habitat present in nature. Even in hostile environments such as the poles, deserts, geysers, rocks, and the deep sea, some types of microorganisms have adapted to the extreme conditions and sustained colonies; these organisms are known as extremophiles. Some extremophiles have been known to survive for a prolonged time in a vacuum, and some are unusually resistant to radiation. Many types of microorganisms have intimate symbiotic relationships with other larger organisms; some of which are mutually beneficial (mutualism), while others can be damaging to the host organism (parasitism). If microorganisms can cause disease in a host they are known as pathogens. For more information, see: Extremophile. Certain microbes have adapted so that they can survive and even thrive in conditions that are normally fatal to most lifeforms. Microorganisms have been found around underwater black smokers and in geothermal hot springs, as well as in extremely salty bodies of water. Microorganisms are used in brewing, baking and other food-making processes. The lactobacilli and yeasts in sourdough bread are especially useful. To make bread, one uses a small amount (20-25%) of "starter" dough which has the yeast culture, and mixes it with flour and water. Some of this resulting dough is then saved to be used as the starter for subsequent batches. The culture can be kept at room temperature and continue yielding bread for years as long as it remains supplied with new flour and water. This technique was often used "on the trail" in the American Old West. The yeast used for the fermentation of beer is not surprisingly called Saccharomyces Carlsbergensis, the famous beer brand being called after the yeast. In its name it is clear S. Carlsbergensis acts on saccharoses (sugar) and producing simpler molecules of alcohol. Microorganisms are also used to control fermentation in the production of cultured dairy products such as yogurt and cheese. The cultures also provide flavour and aroma, and to inhibit undesirable organisms. Microbes are also essential tools in biotechnology, biochemistry, genetics and molecular biology. One of the main reasons that microbes - such as Escherichia coli bacteria and yeast - are important tools is that they are easy to grow and large numbers of them can be studied which makes for rapid progress in genetics investigation. Starting with the work of George Beadle, Edward Tatum, and Joshua Lederberg they played a major part in the rapid advances in biochemistry and genetics between 1945 to 1960. Bacterial viruses - bacteriophages, or just phages - contributed to the growth of molecular biology, pioneered by biologists such as Max Delbruck, Seymour Benzer and Sydney Brenner. Around 1975 with introduction of gene cloning based on plasmids and restriction endonucleases, microbes gave further impetus to the science of molecuar biology, genomics, and biotechnology, and continue to be work-horse tools in many laboratories world wide. Microorganisms can form an endosymbiotic relationship with other, larger, organisms. For example, the human digestive system depends on bacteria that live inside the intestines to help break down food. Microorganisms are the cause of many infectious diseases. The organisms involved include bacteria, causing diseases such as plague, tuberculosis and anthrax: protozoa, causing diseases such as malaria, sleeping sickness and toxoplasmosis; and also fungi causing diseases such as ringworm, candidiasis or histoplasmosis. However, other diseases such as influenza, yellow fever or AIDS are caused by viruses, which are not living organisms and are not therefore microorganisms. Immunology is the study of human animal responses to infection and cancer. It is a major field af medical science allied to medical microbiology. Hygiene is the avoidance of infection or food spoiling by eliminating microorganisms from the surroundings. As microorganisms, particularly bacteria, are found practically everywhere, this means in most cases the reduction of harmful microorganisms to acceptable levels. However, in some cases it is required that an object or substance is completely sterile, i.e. devoid of all living entities and viruses. A good example of this is a hypodermic needle. In food preparation, microorganisms are reduced by preservation methods (such as the addition of vinegar), clean utensils used in preparation, short storage periods or by cool temperatures. If complete sterility is needed, the two most common methods are irradiation with highly energetic photons (Röntgen radiation) and the use of an autoclave (sterilisation at high temperature and pressure), which resembles a pressure cooker. There are no conditions where all microorganisms would grow, and therefore often several different methods are needed. For example, a food sample might be analysed on three different nutrient mediums designed to indicate the presence of "total" bacteria (conditions where many, but not all, bacteria grow), molds (conditions where the growth of bacteria is prevented by e.g. antibiotics) and coliform bacteria (these indicate a sewage contamination). Single-celled microorganisms were the first forms of life to develop on earth, approximately 4 billion years ago. For about 3 billion years, all life was microscopic, and many of the same biological and chemical processes that these microorganisms developed are used today in all organisms. Most microorganisms reproduce rapidly and in great number. This, coupled with diverse mechanisms for genetic exchange and even high mutation rates at particular genes allows microorganisms to swiftly evolve (via natural selection) to survive in new environments. This capacity for rapid evolution is illustrated to the development of so-called 'super-bugs' - pathogenic bacteria that are resistant to many antibiotics. Other example of rapid evolution in microbes are viruses such as influenza and HIV. Influezae regularly evolves new antigenic characteristics, leading to epidemics of respiratatory disease. HIV has exceptionally high rates of mutation, and has evolved a tolerance to most, if not all of drugs used against it. Before Antonie van Leeuwenhoek's invention of the microscope and discovery of microorganisms with it in 1676, it had been a mystery as to why grapes could be turned into wine, milk into cheese, or why food would spoil. Leeuwenhoek did not make the connection between these processes and microorganisms, but he did establish that there were forms of life that were not visible to the naked eye. Leeuwenhoek's discovery, along with subsequent observations by Lazzaro Spallanzani and Louis Pasteur, ended the long-held belief that life could spontaneously appear from non-living substances. Spallanzani found that microorganisms could only settle in a broth if the broth was exposed to the air; he also found that boiling the broth would sterilise it, killing the microorganisms. Pasteur expanded upon these findings by exposing boiled broths to the air in vessels that contained a filter to prevent all particles from entering, or in vessels with no filter but with air being admitted via a curved tube that would not allow dust particles to come into contact with the broth. By first boiling the broth, Pasteur ensured that there were no microorganisms alive in the broths at the start of his experiment. Nothing grew in the broths during his experiments, showing that the living organisms that grew in such broths came from outside, as spores on dust, rather than spontaneously generated within the broth. Thus, Pasteur decisively refuted the theory of spontaneous generation and supported germ theory. In 1876, Robert Koch showed that microbes can cause disease, by showing that the blood of cattle that were infected with anthrax always contained large numbers of Bacillus anthracis. Koch also found that he could transmit anthrax from one animal to another by taking a small sample of blood from the infected animal and injecting it into a healthy one, causing the healthy animal to become sick. He also found that he could grow the bacteria in a nutrient broth, inject it into a healthy animal, and cause illness. Based upon these experiments, he devised criteria for establishing a causal link between a microbe and a disease in what are now known as Koch's postulates. Though these postulates are no longer strictly accurate, they remain historically important in the development of scientific thought. Figure 4. A phylogenetic tree of life based on differences in rRNA, showing the separation of Bacteria, Archaea, and Eukaryotes . Microorganisms can be found in almost all branches of the taxonomic organization of life on the planet. Bacteria and Archaea are almost always microscopic. protists and a number of microfungi are microscopic eukaryotes. Increasingly, the practical identification and classification of micro-organisms is being based on the genetic code, that is, the nucleotide sequence of the RNA in the small ribosome subunit  . Viruses are not classified using this approach because they differer radically from cellular organisms, having no ribosomes or capacity for protein synthesis, and generally no metabolic capabilities. For more information, see: Bacteria. Bacteria, sometimes called eubacteria (true bacteria) to distinguish them from Archaea (formerly called archeobacteria) are structurally the simplest and biochemically the most diverse and widespread organisms on Earth. Generally they consist of simple rod-like or spherical (coccus, pl. 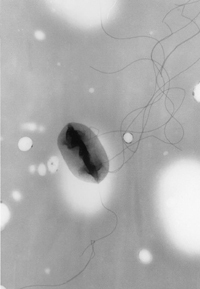 cocci) cells about 1 micron in size without a defined nucleus (and are thus classified as prokaryotes but also classified as Monera in the alternative five-kingdom taxonomy) (see Bacterial cell structure}. Bacteria are practically all invisible to the naked eye, with few extremely rare exceptions, such as Thiomargarita namibiensis. They are unicellular organisms and lack organelles. Their genome is a single string of DNA, although they can also harbour small pieces of DNA called plasmids. Bacteria are surrounded by a cell wall. They reproduce by binary fission. Some species form spores, but for bacteria this is a mechanism for survival, not reproduction. Their generation time can be as short as 15 minutes. Bacteria inhabit practically all environments where some liquid water is available and the temperature is below +140 °C. They are found in sea water, soil, human gut, hot springs and in food. Practically all surfaces which have not been specially sterilised are covered in bacteria. The number of bacteria in the world is estimated to be around five million trillion trillion, or 5 × 1030. For more information, see: Archaea. Archaea are single-celled organisms lacking defined nuclei and are therefore prokaryotes. They were originally identified in extreme environments, but have since been found in diverse types of habitats. A single organism from this domain has been called an 'archaeon'. Although archaea are superficially similar to bacteria when viewed through the light microscope, consisting of rods or cocci a micron or two in size, the details of their chemistry and molecular structure show they have distinct differences from bacteria, for instance in their membrane fats which employ a different stereo isomer of glycerol phosphate in the membrane fat, are ether rather than ester derivatives of glycerol (glycerol di-ethers and tetra-ethers), and based on the isoprenes to form the hydrophobic chain of the fats. These fundamental differences in biochemistry fit with the concept that Archaea and Bacteria diverged in evolution very early in the history of life . For more information, see: Eukaryote, Protist, and Fungi. All living things, including humans, which are individually visible to the naked eye are eukaryotes, with some exceptions, such as Thiomargarita namibiensis. However, many eukaryotes are also microorganisms. Eukaryotes are characterised by the presence of organelles in the cells; these structures are absent in bacteria and archaea. The nucleus is an organelle which houses the DNA. A mitochondrion is vital in production and conversion of energy inside a cell. The mitochondr]] have evolved from symbiotic bacteria. Plant cells also have cell walls and chloroplasts in addition to other organelles. Chloroplasts produce energy from light by photosynthesis. They were also originally symbiotic bacteria. Unicellular eukaryotes consist of a single cell throughout their life cycle (note that most multicellular eukaryotes consist of a single cell at the beginning of their life cycles). Unicellular organisms usually contain only a single copy of their genome when not undergoing cell division, although some organisms have multiple cell nuclei (see coenocyte). However, not all microorganisms are unicellular. Microbial eukaryotes can have multiple cells. Of the eukaryotic groups, the protists are always unicellular, and thus microorganisms. This is a diverse group of organisms which do not fit into other groups of eukaryotes. Several algae species are unicellular plants. The fungi also have several unicellular species, such as baker's yeast (Saccharomyces cerevisiae). Animals are always multicellular, although they may not be visible to the naked eye. Viruses are defined as replicating entities that lack both ribosomes and the capability of metabolism. Furthermore, they possess only one type of nucleic acid, either DNA or RNA, as their genetic material and, although they depend on cells for their replication, are able to persist independently in an infectious form outside of cells, and evolve and diversify by natural selection. The main division of viruses is between RNA viruses and DNA viruses. Another major distinction is between enveloped viruses, with an outer lipid bi-layer membrane, and non-enveloped viruses, without a membrane. In general, DNA viruses tend to be enveloped, while RNA viruses are non-enveloped, although retroviruses are an exception. The War of the Worlds, where microorganisms play important thematic and plot-related roles. ↑ Dairy Microbiology. University of Guelph. Retrieved on 2006-10-09. ↑ Knoll, Andrew H.; (2003). Life on a Young Planet: the First Three Billion Years of Evolution on Earth, 1st ed.. Princeton University Press. ISBN 0-691-00978-3. Dixon, Bernard (1994). Power Unseen: How Microbes Rule the World, 1st ed.. W. H. Freeman, Oxford and New York. ISBN 0-7167-4504-6. Krasner, Robert I. (2002). The Microbial Challenge: Human-Microbe Interactions, 1st.. ASM Press, Washington, DC. ISBN 0-13-144329-4. Knoll, Andrew H. (2003). Life on a Young Planet: the First Three Billion Years of Evolution on Earth, 1st ed.. Princeton University Press. ISBN 0-691-00978-3. Postgate, John (1992). Microbes and Man, 3rd ed.. Cambridge University Press, UK. ISBN 0-521-42355-4. Microbes and toxins important in food US Food & Drug Administration Food Safety's Bad Bug Book. This page was last modified 05:34, 29 March 2009.